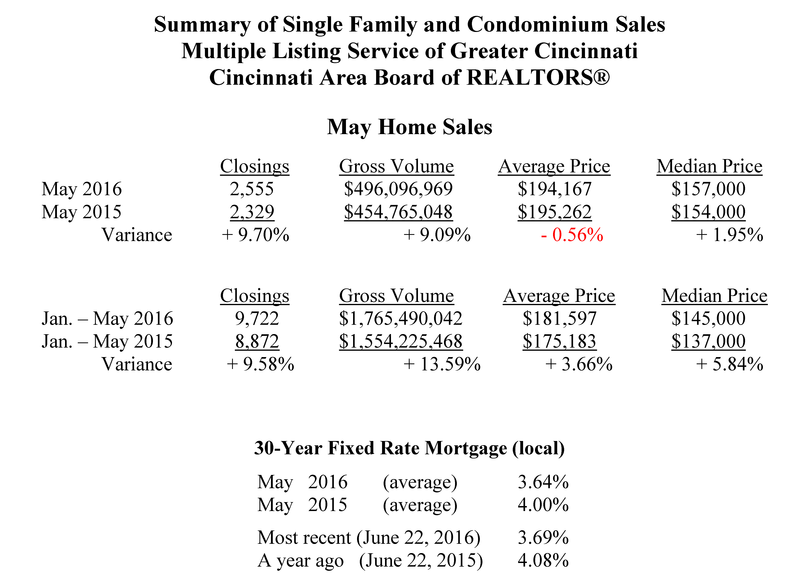 Greater Cincinnati home sales this month were up + 9.7 %, compared to a year ago. May home sales were 2,555 compared to 2,329 in May 2015. For the first five months of 2016, home sales are up 9.6% over the first five months of 2015. “May home sales continue their upward momentum in 2016,” said Patti Stehlin, President of the Cincinnati Area Board of REALTORS®. “As long as interest rates remain at their low levels, home sales will continue to remain strong. Even though our housing prices are rising, Greater Cincinnati remains very affordable for the first-time buyer as well as the current owner who wishes to make a change,” said Stehlin. There was little change to the average home price at $194,167 compared to $195,262 a year earlier, a – 0.56 % decrease. At the same time, the inventory of homes for sale, as of May 31, continued its year-over-year declining trend to 6,781 from 8,679 a year ago, down – 21.9%. “Our current inventory of homes for sale is similar to the inventory levels back in the years 2000, 1994 and earlier. In the past 10 years, our levels grew due to the influx of short sales and foreclosures. Today, we have seen a tremendous decline in distressed or bank-owned property. So, if a home is priced right and is in move-in ready condition, properties are selling quickly,” said Stehlin. Local home mortgage rates in May averaged 3.64% for a 30-year fixed rate loan. The rates were higher at 4.00% a year ago. At these fixed rates, the monthly principal and interest payment on a $100,000 home loan with no money down would be approximately $457. Nationwide, May home sales were up + 1.8% from April on a seasonally adjusted basis, and were up + 4.5 % from May 2015.